This evening, December 8, Art of War Cage Fighting closes out a successful year with what promises to be an explosive fight card from bell to bell at AOW4, and it all takes place at the legendary 2300 Arena in Philadelphia, PA.
Jesse Stokes was looking to try to make yet another return to the cage after a lengthy layoff. Tonight Stokes was supposed to fight Frankie Coleman at heavyweight. Stokes posted on social media just about an hour before the fight card began that he was informed that his opponent was arrested on his way to the venue and would not be competing. Stokes was supposed to compete at AOW3 several months ago but that fight too was cancelled after that opponent pulled off the card during fight week. With four title on the line, on top of two Philly legends in the Martinez Brothers (Will and Jesus), closing out the show, fans were more than pleased for Christmas to come early to the “City of Brotherly Love”. Jesus Martinez and Tony Parker headlined the fight card. Parker and Martinez have a short feeling out process until finding each other’s range. The pace slowed a tad but each combination was with vicious intent. Martinez stepped up the pace coming forward with several kick attempts some landing more violently than others mixed with punches that pressed Parker against the cage with minimal defense or return action. Martinez continued the punishment to close the round. After the doctor examines Parker, Jesus Martinez is declared the winner via TKO as he broke Parker’s forearm with a kick. In the co main event of the evening, Will Martinez and Jeremy Pender have a brief standing exchange with Martinez landing the crisper of the shots. They work their way to the ground and it’s all Martinez’ world at this juncture. Martinez is landing strikes with more and more ferocity as well as accuracy while also looking to lock up an arm which turns into a back and forth ground scramble with Martinez coming out on top and closes the round on top landing bombs. Round 2 starts with Pender attempting to begin the attack first but Martinez had combos to counter like a man seeing the future. Martinez slipped a punch attempt to easily switch levels to get the fight to the ground and work to gain side control. All while peppering shots and transitioning to Penders back with both hooks in. Martinez continues to pepper shots to the head of his opponent while also actively seeking the neck which he finds and secures for the tap at 4:13. Philadelphia’s own, Steve McCabe would compete in his fight tonight when he meets Ricky Nuno. McCabe starts pawing first to find the distance. Both take turns with brief explosions with McCabe landing more effectively and building confidence when all of a sudden Nuno landed a single straight right to put Steve out. The referee stepped in to halt the contest, but some confusion followed as to his final verdict of interrupting the action (as he did not signal a stoppage). Nuno, whom also seemed confused as to the status of the contest rushed to follow up and finish the bout if deemed necessary but fortunately the ref informed him the contest was in fact over. As Nuno plead to all parties involved in the evening that he meant no ill will in his follow up attempt, and clarifying he simply didn’t know the bout was called to a halt. Kareem Murray dictated a lot of his fight with Timmy Tyler, firing and landing a series of brutal knees to the head like he was skipping rope in rounds 1 and 2 which looked to rock Tyler early. Kaheem would follow Tyler to the ground to continue with more punishment. Tyler started showing signs of life late in the 2nd but Murray, again, pushed Tylers head down and the knees would fire away. Finally the ref saw enough and called a halt to the contest declaring a TKO victory for Kareem Murray. 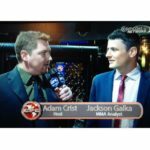 Andre Petroski is a rising star and could very well end up being the amateur fighter of the year in Pennsylvania as he made quick work of Andrew Johnson to claim the advanced amateur welterweight title. There was no love lost between Joe Pyfer and Adam Atiyeh, two fighters who did not like each other. After a shoving match at yesterday’s weigh-ins, it took just one big punch from Pyfer to lay Atiyeh out, face down in a pool of blood. It appears Atiyeh’s tooth went through his lip, and the fighter was knocked out cold. Pyfer wins in the first round by knockout. John “Bearcat” Brennan won the AOW amateur lightweight title with a decision win over Duane Shields. Martinez BJJ standout Matt Turnbull made quick work of his opponent Mariano Vidro with a first round TKO. John Tuxford won a split decision win over Bradley Flash Santana.